An essential marketing tool, our Business Cards ensure the first impression you make is the best it can be. With this option, all four corners will be rounded to a radius of 1/8". Care should be taken to ensure that no important elements are too close to the edge to make sure nothing gets cut off. With this option, all four corners will be rounded to a radius of 1/4". Care should be taken to ensure that no important elements are too close to the edge to make sure nothing gets cut off. A good Business Card is memorable and is usually the earliest chance to create a first impression. A successful card is not just about the design of the card, but also making sure the graphic design takes advantage of the stock, finishes, size, and shape. 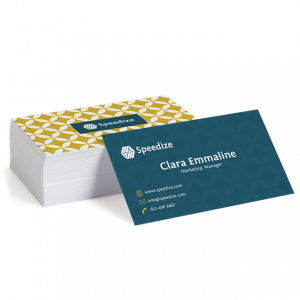 We offer heavier card stocks and special finishes to make sure both the card and the impression stick around long after the meeting has ended. For business cards with 1 or 2 colour printing, including Pantone colours, please check out our 1 & 2 Colour Business Cards. While there are many combinations available for business cards, the most common order is a 3.5” X 2” card on 14pt Gloss Cover cardstock. 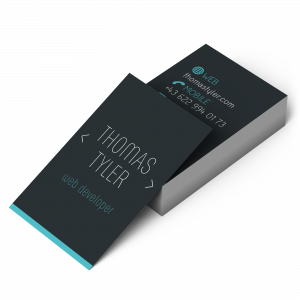 Business cards often feature full-colour (4/4) printing with UV coating on the front and back. Other options can include 4-colour business cards, which are a good choice for those looking for smaller quantities and a greater selection of stocks. We also offer 1 & 2 colour business cards which can be printed with one or two colours, including Pantone colours. By ordering digital magnets or digital plastic, magnetic and plastic business cards are available. Business cards are a tradition. They have become a time-honoured way for people to exchange contact information and give the people an instant visual impression. Because of the small size, you can keep these cards with you all the time, which means you will not miss an opportunity to make a valuable new contact because you left your cards at home. To make your card more beneficial, you can use it as a tool to transform new contacts into new customers. To do this, you may want to put a coupon or a special offer on the back of your card. While business cards are often handed off in fact-to-face interactions, there are many more uses for these. Tucking cards into sales kits and presentation packets is a good idea, and business cards are often put out in public places as a marketing effort. Regardless of advances in technology, business cards continue to be vital in our digital age. People still need to exchange contact information quickly and easily, and cards facilitate this. Some recipients may enter the information from the card into their smartphone, tablet, or computer manually or by scanning the card and using an app to gather information from it. Including a QR code on your card can provide recipients with even more information about you and your business, brand, or product.